Where does the addicted president of a treatment nonprofit go for help? 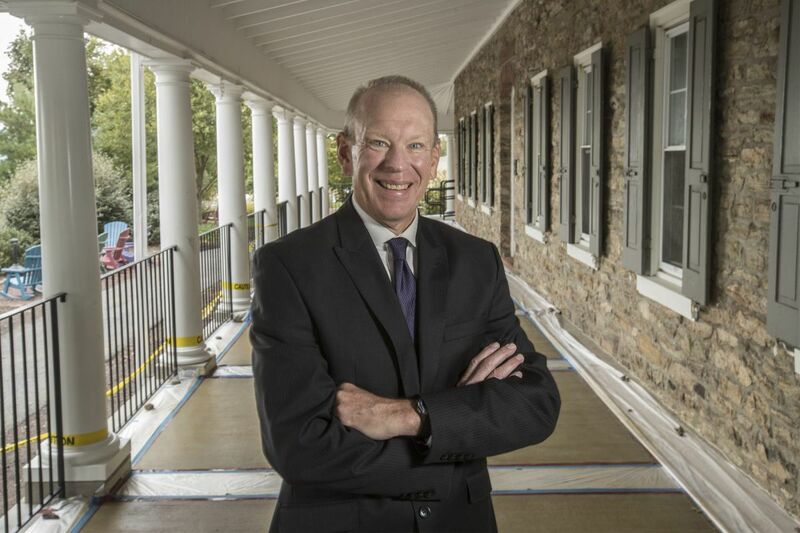 Doug Tieman, chief executive of Caron Treatment Centers, at Caron’s headquarters in Wernersville, Berks County. In his darkest moments, overcome by guilt and shame, Doug Tieman prayed, "God, help me figure this out. Where does the president of one of the nation's nonprofit treatment centers go for help? How do I tell my wife? How do I tell my board? How do I tell my employees?" And then help came, in the form of an arrest for drunken driving. "God did for me what I couldn't do for myself," said Tieman, 62, chief executive officer of Caron Treatment Centers, who has been sober since that episode nearly 10 years ago. "I look at my DUI as divine intervention. Fortunately, I didn't hurt anybody, didn't hurt myself, and I was able to get treatment. How were you able to hide your drinking problem for so long, especially being an executive? My ability to rebound was, by most standards, pretty remarkable. Anybody in an executive position usually has some other attributes and characteristics that we can use to hide, camouflage our illness. I used every executive function I had. You can have someone cover for you. You can set your schedule. You have the financial wherewithal that you've got a driver. We also tend to overcompensate for the disease, because we look really good. We're successful. People say, 'He works hard, he parties hard.' It's societally accepted, maybe even applauded. My workaholism would kick in, I would say, 'I need to work 14-hour days to try to do a little penance.' I'd be a super dad. I coached all my kids' teams. Finished our basement, built a deck. Do you think this experience helps your work? I tell executives in recovery that we're going to use those same skills for recovery — planning, holding ourselves accountable. If you are in recovery, you don't have to put it in the employee newsletter. But when you travel [if that's a trigger for drinking], let people know. Otherwise, you could be in a conference with 2,000 other people, and they're handing drinks around and nobody will know. Set yourself up with a level of regimen and hold yourself accountable to it. Let’s switch gears from alcohol to opioids. Why is the opioid/heroin crisis getting so much attention? Take crack, booze. Nothing new about addiction. It happens so quickly. For alcoholism, in most people, it's 10 to 20 years before it's a problem. So it's like eroding a rock away over time with water. Same is true with cocaine or crystal meth. This is faster. You can have some 22-year-old kid experimenting, and they're dead. It's quick, and it's dramatic. With the first heroin epidemic [after the Vietnam War], 1.5 people per 100,000 died of a heroin overdose. Today, the national average is 15, so 10 times worse. In states like West Virginia, it's over 40; Pennsylvania is over 25. What should executives do about opioids? Number One: Don't put your head in the sand. Number Two: Make sure you have an up-to-date drug policy. Anybody who goes out on any work-related injury, 75 percent of them will be prescribed an opiate. Just know that. When they come back, that's when you need to have a plan in place that says you can't use them during the day. That's why [the labels say] don't operate heavy machinery. Your judgment is impaired. You need to make sure your insurance is paying for alternative forms of pain management. Most insurers will readily pay for oxycodone, but they won't pay for physical therapy. How do we, as a society, beat this problem? First and foremost is have a long enough time for treatment. Most Americans don't get enough time. The second one is just having appropriate medical care — medication-assisted treatment. Instead of spending so much on the criminal justice system, let's help those individuals become sober, productive members of society, instead of having people locked up. Any message for those in recovery? You grew up on a farm. What was the worst job? Shoveling manure is really quite unpleasant, but it's the reality of what you have to do. Family: Wife, Frances; children, Teresa Detwiler, 31; Mark, 28; twins Elizabeth and Emilie, 26. Diplomas: Concordia University, education, social studies; Northwood, business; University of Minnesota, a "mini-MBA." First job: At age 6, collecting and washing eggs at his family's pork and poultry farm in Missouri. Where: Wernersville, Berks County; locations in New England, Florida, New York City, Atlanta, Philadelphia, Washington, D.C.
What: Provides addiction and behavioral health-care treatment. Serves about 3,500 patients a year, with 2,200 receiving residential treatment; 368 beds. Dollars: $104.4 million in annual revenues; primarily private pay. Provides $10 million in financial assistance to patients.